Is it snowing in Mount Crescent ?¡Gracias! 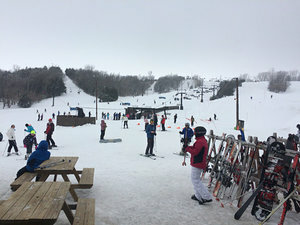 Mt Crescent in the United States (Iowa State) is a tiny ski resort with just two ski lifts with only 91 metres (300 feet) of vertical descent. Mt Crescent has 40 acres of terrain over 9 trails. Mt Crescent is only really suitable for beginner and intermediate skiers and snowboarders. We have no information about the existence of any cross country ski trails at Mt Crescent. For snowboarders, there is a terrain park. All of the trails at Mt Crescent are covered by snowmaking.